Smith attended Bishop Luers High School in Fort Wayne, Indiana, where he was a letterman in football, basketball and track. In football, he won the Butkus Award as a senior, given to the best high school linebacker in the country, and was named the Mr. Football award winner for the state of Indiana. He helped Bishop Luers to 40–28 win over Indianapolis Cardinal Ritter in 2012 Indiana 2A title game while rushing for 150 yards and scoring three touchdowns, as Bishop Luers became first Indiana 2A school to win four straight state titles. He finished with 1,265 rushing yards and 18 TDs on 176 attempts as senior in 2012 to go with 10 receptions for 66 yards and two more TDs. Defensively, he recorded 72 tackles (43 solo), 19.5 tackles for loss, eight sacks, two forced fumbles, one fumble recovery and seven pass deflections. In basketball, he played as a freshman, sophomore and junior, and was teammates with former Ohio State star Deshaun Thomas. In track & field, Smith competed in events ranging from the relays to the shot put as a senior. At the 2013 IHSAA T&F Sectional, he took fourth in the shot put, with a PR of 14.81 meters (48 ft 6 in), and ran the lead leg on first-place 4x100m (43.43) and fourth leg on second-place 4×400m (3:27.08). At the 2013 SAC T&F Meet, he anchored the Bishop Luers' 4×100m relay team, winning the event with a time of 42.91 seconds, and the 4×400m, which finished in third place, while also placing third in the shot put (47 ft 5 in) and eight in the 400-meter dash (53.46 s). Jaylon’s history of playing 7v7 at Athletes with a Purpose (AWP) is very decorated as well. During the 2012 season the team was the 2012 IMG Midwest Elite Regional Champs, as well as being nationally ranked 5th at the IMG National Championship. The team went 24-8 for their overall record. In 2013, the AWP 7v7 football team won the IMG Midwest Elite Regional Championship for the second year in a row, as well as snatching the 2013 Pylon Midwest Regional Championships as well. AWP also moved from being ranked fifth to now being nationally ranked third at the IMG National Championships. They also improved their record to 39-4. In 2013, Smith won the starting DOG linebacker position beating out Ben Councell, after incumbent starter Danny Spond had to retire due to migraine issues. Starting all 13 games, he recorded 67 tackles, including 6.5 for loss, one forced fumble, three pass break ups and one interception. His best game came in a 34–30 victory against Arizona State, where he recorded nine tackles, including 1.5 for loss. He notched his first career interception against USC on a pass thrown by Cody Kessler. With the arrival of new defensive coordinator Brian VanGorder, he was moved to an inside linebacker position. He was one of three players to start all 13 games on defense, recording 112 tackles, including nine for loss, and 3.5 sacks, adding two pass breakups and one forced fumble. He was named the FBS Independent Co-Defensive Player of the Year, along with teammate Joe Schmidt IV and was named a second-team All-American by the Associated Press. During his junior year in 2015, Smith played in all 13 games with 115 tackles, nine tackles for loss, one sack, five passes defended, two fumble recoveries, and 1 forced fumble. He won the Butkus Award, given annually to college football's top linebacker. During the Fiesta Bowl game against Ohio State, Smith suffered a knee injury in the first quarter and left the game. It was confirmed that the knee was diagnosed with tears to the ACL and LCL. He underwent successful knee surgery on both ligaments on January 7, 2016, and luckily, there was no nerve damage. On January 11, 2016, Smith announced he would forego his remaining eligibility and enter the 2016 NFL draft. In 2017, Jaylon made his NFL debut on September 10, starting at middle linebacker against the New York Giants in the season opener. He recorded 7 total tackles and a forced fumble. In the following game against the Denver Broncos, Jaylon recorded 14 tackles. During the start of the season, injuries to other linebackers forced the Cowboys to play Smith more than expected (63 tackles in the first six games). Jaylon was exposed a great deal, specifically in passing situations, which caused struggles for other teams. In the last 10 games he was used as a backup. He finished with 1 sack and 81 tackles, which is one of the highest single-season totals by a first-year player in franchise history. Going to Africa and giving back has meant everything to Jaylon because it has exemplified his purpose beyond athletics in a unique and wonderful way. Giving back has always been a huge part of Jaylon's life whether it has been through donating time, money, resources, knowledge or anything at all because to him, it is about giving back to the world and helping himself grow. Jaylon views giving back to his community and the world as his purpose and he learns greatly from people who have given back to him. South Africa was extremely important to Jaylon because he was able to gain so much knowledge regarding his ancestors and where he originated from. 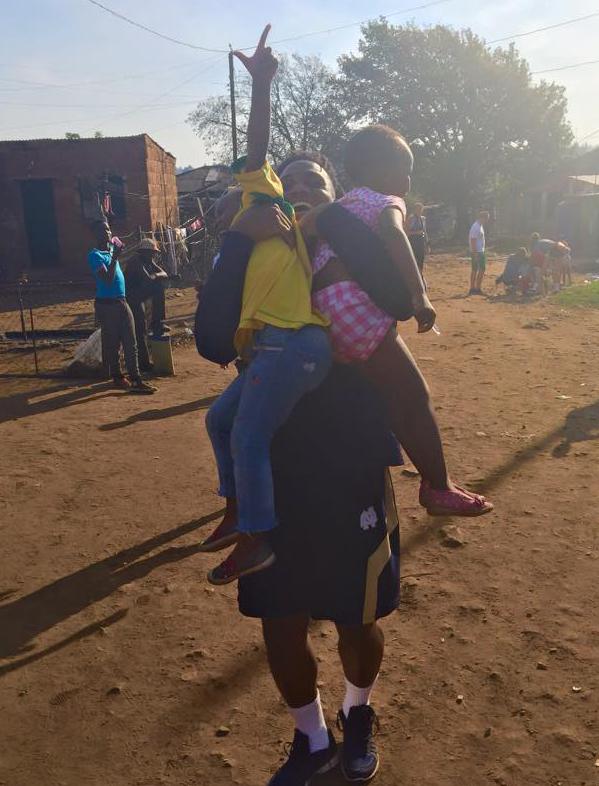 Growing up hearing stereotypes and later in life getting the opportunity to actually travel to South Africa was a great feeling and very eye opening and changed many perceptions for Jaylon. Traveling to South Africa meant so much to Jaylon that he actually got the continent tattooed on himself. He is very proud to have originated from such a place and counts himself as extremely blessed to have had the opportunity to have traveled there. Jaylon can't wait to travel back to South Africa in the future and is excited for many more opportunities to give back. Jaylon Smith spends an evening speaking with the students of My Brother's Keeper/My Sister's Keeper out of Fort Wayne, Indiana. He shared with the children about overcoming adversity, and he also allowed the children the opportunity to ask him questions. 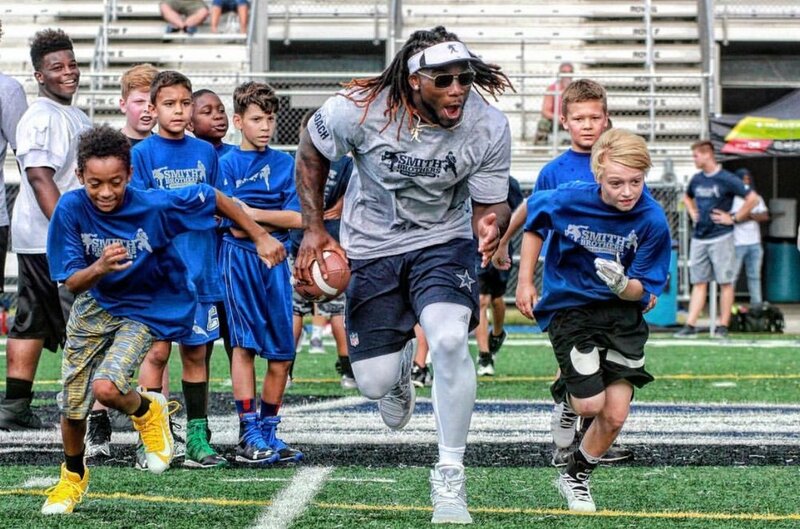 Rod and Jaylon Smith "Earn Your Stripes Football Camp"